John Opper served on the faculty of Woman’s College (later UNCG) between 1952 and 1957. Gregory Ivy, founder of the Department of Art and the gallery that later became the Weatherspoon Art Museum, hired Opper to teach painting. While there, Opper was a powerful teaching force for many students. Working in tandem with Ivy, Opper traveled to New York in 1954 and purchased the famous de Kooning painting, Woman, now in the permanent collection at the Weatherpoon Art Museum. Opper met and studied with Hans Hoffman while in New York in 1935 and 1936, and began his artistic exploration of forces and tension within the picture plane. He served as a founding member of the American Abstract Artists Group, which formed in 1936. 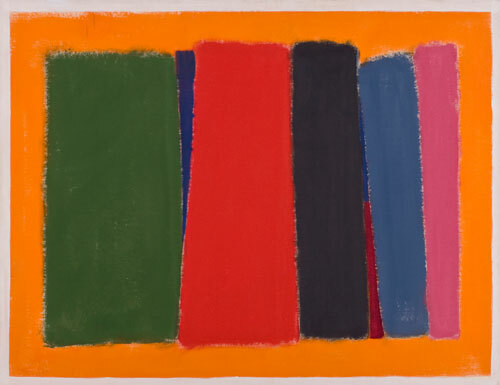 He became known as an Abstract Expressionist, a painter of large canvases in which vertical bands of varying widths pulsed with deep and rich colors, as demonstrated in Untitled. His gesture was controlled, yet dynamic; his overlays of color luminous and tactile. In these works, he strengthened his commitment to “painting as painting”, that he first developed as a Hoffman student. His work is represented in numerous public collections, including the National Museum of American Art in Washington D.C., the Whitney Museum of American Art, the Metropolitan Museum of Art, the Museum of Modern Art, and the Weatherspoon Art Museum.